Wherever you are, I hope it’s warmer than here. It was 11 degrees when I woke up, and it’s not rising out of the 20s until tomorrow morning. But the wind chill drops the temperature down to the negatives. I can’t get warm. I read about CharityPups.com in the gift guide of one of the many magazines I collected around the holidays. 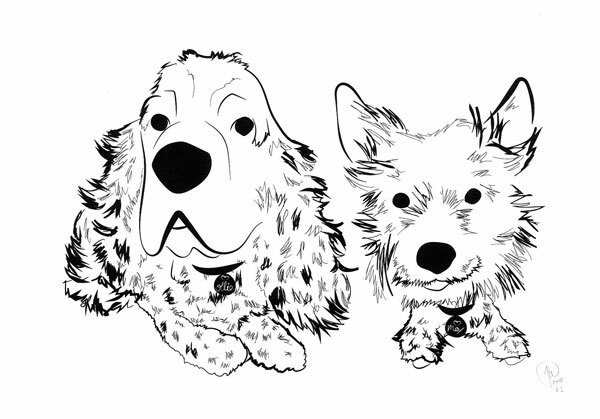 The concept is simple: you pay some money, upload pics of your dog(s), and Aaron Kaufman will create a custom digital sketch of your pooch(es). I was looking for something to top off WM’s gift pile, so I decided to take a chance. Isn’t it amazing? He got every aspect of my wee wolves perfect, especially Max’s weird underbite and Ollie’s fuzzy head. This was the best gift idea I’ve had in ages, and if there is a dog lover in your life you should take the plunge and get them this. Best of all, 30% of the profit goes to charity — Aaron picks a different one each month!